Interesting observation! And it's always nice to see other entries here besides the usual reviews. Still, you're kind of comparing apples and oranges: While this blog focuses on free jazz and improv (and anything related), Downbeat is more focused on the traditional sound of jazz. I just can't imagine them reviewing the named artists and neither can the majority of their readers. But I think a label like "best US traditional jazz artist" or something like that would at least give their readers a hint that there's a lot more to discover out there. I much prefer AllAboutJazz, who sometimes suffer under the same problem and sometimes praise too much (especially those bland ECM-by-numbers releases), but still they have a much wider view of the jazz world and regularly point me to some interesting artists I otherwise may have overlooked. Anyways, keep up your good work! Of course I can only agree, I realized the same attitude in their poll three years ago (or so) and was as upset as you are today. The poll (and Downbeat in general) has been a lecture in ignorance on several levels: They obviously think that this music takes place only in the US (at least on a level they consider appropriate), which you have already mentioned. Imagine Europeans thought that classical music is mainly properly played by European musicians – how ridiculous would that be? I still remember what a big deal it was when they had their first European band on the cover (E.S.T.) and what a fuss was made about that fact (that was in 2006!). Then they disrespect free jazz in general, obviously something they have never really appreciated. The fact that Hamid Drake, Peter Evans and Ellery Eskelin are not on the list is a mere disgrace. Finally, the whole thing is even more shameful if you realize that a considerable share of Jazz’s audience is in Europe, many musicians have clearly stated that despite tremendous cuts on cultural subsidies they literally were hardly able to survive if they couldn’t tour Europe. Actually this is a debate that has been going on since the Marsalis vs. Free Jazz musicians in the 1990s and it is even more annoying when you read articles that give you the impression that the bookers of local jazz clubs are grey-haired old men of the 1968 free jazz generation that block out other music than theirs (which has recently happened in the big German weekly newspaper Die Zeit). It is just the opposite! Although there is a very vivid scene and even growing interest in this music, there is lesser and lesser cultural support for it (especially if you compare it to classical music). As for me, I have simply decided to negate Downbeat in general (which – in the end – made me search the internet where I found freejazzstef), they have nothing to tell me. Indeed. To me, it is not only a question of subgenre, just of geography. There are plenty of excellent mainstream jazz musicians outside of the United States that could equally figure on their list, but don't. I agree with what you said. I also think many of the players listed are not really true jazz players. When the word jazz is used, it must refer to it from an historical point of view. If you are a free player without a jazz influence, you are not a jazz musician. You are an improvising musician. There is a big difference. When you listen to John Coltrane as he progressed from bebop-modern-free form, there was always an element of history and jazz in his playing and many from that era had that. There are some today who have that, but some of the younger ones don't. What I am saying in regard to Downbeat, lumping them all together in not what it should be. Sadly, ‘twas ever thus. A few years back I sent a letter to the Downbeat letters page raising similar concerns. Needless to say it wasn’t published. On a positive note though, Cadence has always had a more worldly view. Hmmm... While I don't want to take anything away from Stef's point about the parochial tendencies of Downbeat, I think it's worth mentioning that the magazine is not exactly unwilling to review (and appreciate) a lot of the more adventurous improvised music being recorded these days. Sure, there's a lot of mainstream stuff in Downbeat; most of its readers prefer that genre of jazz. And yes, as Stef notes there's a definite American bias to a lot of their coverage. So their polls reflect that. But I don't think it's at all fair to suggest that the magazine is totally without a clue when it comes to the freer side of the music. And personally speaking, as someone with rather omnivorous tastes in jazz, I can appreciate the way in which Downbeat is at least making an attempt to incorporate a lot of the different strands of contemporary jazz in its coverage. Would it be a better magazine if it covered more of the music from outside the U.S.? Without a doubt. But I'm not yet ready to see the magazine as a completely lost cause, by any means. however what is truly amazing is that as someone said above - that Hamid Drake isn't mentioned or was left out or whatever. We all know many of the musicians listed may be considered something other than jazz - but Hamid Drake IS jazz, he is all of it - all of the so-called tradition - and he's left off. all I know is I'm seeing him again in OCT with William Parker's In Order to Survive at The Stone with Lewis Barnes, Rob Brown and the *great* Cooper-Moore. I bet Cooper-Moore is also ignored. 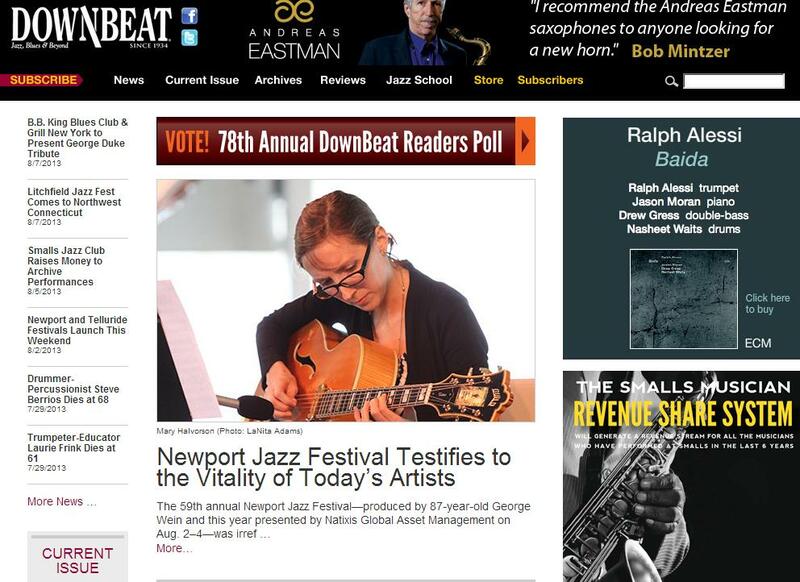 fwiw, I havn't read downbeat in over 10 years. btw - for the above, I am not meaning to be anonymous but I have no clue how to do what I need to do. fwiw I'm Steve Reynolds and I read all the reviews here. I post a bit on some jazz bulletin boards and I VERY much appreciate the coverage of the lesser appeciated European improvisors. Imagine a liste of bassists WITHOUT John Edwards, Paul Rogers and Simon H. Fell? well we have that list and it is pathetic. I agree with you about Cooper-Moore and some of the others you mention, although as far as I can recall Hamid Drake was definitely included in the reader's poll--I remember voting for him, as I usually do. For what it's worth, Drake did get a pretty good number of votes in the critics' poll, both in the "drummer" and "percussionist" category (where he placed third). Not to mention that William Parker has certainly gotten a fair amount of love from Downbeat over the years, IMHO. that was fun to fill that out. my write in votes were Martin Kuchen on baritone sax and Kris Davis for composer and arranger. Maybe I was a bit too harsh as to Downbeat magazine in general when I claimed that they have nothing to tell me. In this case Troy is right and he is also right that they list some artists of the free genre (I have to admit that Hamid Drake is on the list for drummers - anything else would have been ridiculous). So I was too cheeky here but what I wanted to say is that I tried several magazines (both German and English ones) and thought that they did not write as extensively as I would have liked it about the music I love. So when I said that they have nothing to give me I meant that I did not want to spend money on a magazine which mostly writes about music I am not so much interested in. That’s why I decided to try the net and stuff like allmusic.com, point of departure, etc. (sometimes even The Wire). Especially the labels on the list are pure fun (Sony?). Leaving out Multikulti, NoBusiness, NotTwo or Trost is not understandable. Some of the names on several lists made me also shake my head: Diana Krall and Melody Gardot (really?) or Dave Brubeck and Bill Dixon (they are great, we all know that, but they are not longer with us, so what sense does this make?). But in the end there is still the geographical aspect which is not comprehensible. Jazz is a phenomenon that takes places outside the US to a large extent as well, this is not represented in these lists. By the way: Why are you only allowed to choose from a list? Thanks guys for all the comments, and I repeat, my point was more about the geography than about the kind of jazz. There are plenty of good mainstream jazz musicians around the world at the same level of the ones mentioned. True, Hamid Drake was on the list. Apologies for thinking he wasn't. I wish. I could say I was shocked, but not nearly. For a genre that has been popular in Europe since Sidney Bechet in the '20s, it's sad how many Americans can't move beyond Miles and Coltrane as reference points. Speaking from Canada, in such close proximity to the media protectionism that encompasses the USA, all I can say is that I am not at all surprised by the lack of worldwide representation in Downbeat's lists. (The most galling omission to me personally has to be Nate Wooley, a leading light on any continent). That would take a healthy curiosity and open-minded investigation into musical activity existing outside the American realm. Without getting overtly political, theirs is a smugly self-centric society and sadly proud of it. As in music, as in most things. Good lord FreeJazzJeff, generalize much? As an American that is quite interested and informed about players from all around the world I must say that I think this publication is completely irrelevant in this and any country. It plays to a certain casual listener of sorts that buys the magazine so he can lay it upon his coffee table and appear "cultured". It is ad revenue driven and thus sponsored by giant record industry conglomerates, so rightly they must in turn give lip service to their benefactors clientele. Just so happens the biggest (wealthiest) and most influential of these industry groups are U.S. based and profit from their "easy to market" jazz records. Distribution is focused in the U.S. market so the U.S. players are an easy sell. Plain economics, quite twisted but one shouldn't expect anything less from an industry that is grasping at straws to stay viable. As Paul grant rightly says, I wouldn't take to much notice of Downbeat it just blows a lot of hot air around. If you look around the net there are quite a few discussions going on - of exactly the same nature here - about the validity of these polls, and of course the magazine articles that promote the same music. I've also written a few comments on various blogs, some have had positive responses, others not. At the moment I'm having to write a short paper - for my university - on jazz education. One of the main things I've noticed is that (unfortunately) the yard-stick that is held up for judging jazz and improvised music is American based. Unfortunately this is based on the idea that improvisation only started (or was invented) in the US of A - not so, I think. This is gradually changing, but not that fast. Maybe the UK, Norway and Denmark seem more open to other musics in their conservatory systems, but for the rest it's licks, patterns, scales and respect to Duke Ellington that gets you the credits. One also has to only take a look at audience attendance figures to see American jazz sells well, comparatively ... and that includes young players looking for idols. If you're interested to get an understanding of how American jazz musicians see the world listen to Jason Crane's podcast. Jason (who reads our blog) has a podcast about jazz and if you listen, or check the back listings, you'll notice that there's little or no mention of European musicians, and one reason I stopped listening to his podcast. What was most interesting was the total naivety of the musicians interviewed, many have no knowledge of European musicians and consider them 'lesser' beings. For them the proving ground is New York, if you've made it there then you're 'in'. Lastly - we could talk about this for ever and a day - we only have ourselves to blame (nobody in particular). American art, cinema, literature, pop music and the internet is high on many people's lists. I suggest that by supporting your local scene and European music in general - if it's good - then our musicians may get a higher profile and hopefully the public might start to see the musical heritage which is around them. Lastly, lastly ... thanks Stef for bringing up this subject yet again. Maybe one day someone from Downbeat or Jazz Times etc may read our little blog and discover a whole new world of exiting music! I've written posts nitpicking Downbeat's polls most years in the last decade, and there are lots of ways you can slice them up. For instance, in my piece on this year's Readers Poll I complained about the omission of Scott Hamilton under tenor sax -- turns out they're even less likely to list retro-swing or trad jazz musicians than they are avant-garde. The shortage of European (and for that matter Canadian) musicians has been a constant problem, but aside from the usual chauvinism I think a bit part of it -- at least in the Critics Poll, which I've voted in for three years now -- is how much presence and support labels provide. To cite what I thought was a bellweather case, back when Blue Note released an album by Gianluca Petrella, he polled very well, much better than trombonists with more substantial careers, like Wierbos or the Bauers. So to a large (and probably embarrassing) extent the Critics Poll reflects publicity budgets and coverage, and small European labels have trouble denting Downbeat's nearly all-American critics base. (Similar things happen with the Readers' Poll, a couple extra steps removed.) I manage to hear (and review) about 600 jazz albums a year -- maybe 25% of those are by European artists and/or on European labels, and that's probably more than most US-based critics can say. Still, I doubt I get 25% of the records reviewed in the Free Jazz blog. Everyone gets a pretty limited view of the big picture, so we always miss things.